People often want to know which self hypnosis and NLP techniques I use personally. This is a great question, and I am happy to acknowledge that I use a variety of techniques, from meditation and self hypnosis, future pacing, and more. I use these techniques because I find them effective, and because I’m just like anyone else–from time to time I need something to shift my state to a more resourceful and positive one! One of the techniques I like the most and find handy to use is Automatic Thought Shifting. Some people call it thought replacement, you might find it akin to an interruption technique and similar to a swish in some ways, if you’re familiar with NLP. A lot of these techniques tend to work well together and when we find what works for us, I think a lot of us tend to combine these techniques in ways that are uniquely effective. The Automatic Thought Shifting technique is similar to an NLP swish in that the old, unwanted, unresourceful state (the negative thought & feeling), with practice TRIGGERS the new resourceful thoughts & their accompanying positive feelings. It doesn’t take long, but in the beginning, this technique requires some conscious practice and consistency. It’s similar to an interruption technique because, rather than letting the negative feelings continue to run through their normal course, you stop them and send your energy in a different, preferable direction. How it works. When you feel the feeling you don’t want, you then tune in to what is the THOUGHT or THOUGHTS that created that feeling, then you SHIFT to a positive thought or thoughts and focus on the good feelings generated by that thought. More on exactly how in a bit. First, its important to understand that EVERY THOUGHT creates its own unique chemical signature. Those chemical signatures then are interpreted as our feelings. You’re more likely to FEEL the unwanted FEELING first, and think something along the lines of, “I don’t want to feel this way,” or “there’s THAT feeling again,” than you are to be aware of the thoughts that preceded the feeling. Also, I’ve added an important step to how I do this process that is different than what I’ve seen elsewhere. I don’t spend any time focusing on the details of the negative thought and it’s negative feelings, but I spend a good bit of time focusing on the very specific positive feelings generated by the replacement thoughts, and how they vary and differ from each other and exactly what their nuances are. I find this helps my brain to “read” and step into the positive feelings (chemical signatures) of the positive thoughts both more quickly and more completely. OK, so, a “for instance” is in order now. I frequently find myself with more on my plate than I can do in the amount of time I have and/or would LIKE to be able to accomplish all my tasks in. It’s OK, that’s where I’m at in life. For example, I am currently writing a book, editing a book for another professional at the request of his publisher, developing three online teaching programs, and preparing to teach two new courses at the college where I teach and getting ready to travel to two national professional hypnosis conferences, both of which I am presenting at. I also need to see clients every day, because that’s how I earn a living, and of course that means managing every aspect of a solo-entrepreneurship. Meanwhile, back at the ranch, I have a husband, a daughter, two dogs and a cat, all of whom (deservedly) expect some of my time, energy and attention every day. I also need to find time to fill my own soul, and to write this blog! Now, each of these thoughts bring similar but uniquely different variations of positive feelings and they put me into a resourceful state where I can get an AMAZING amount of work done. The first thought, “I always manage to get it all done and done well,” brings back feelings of pride in past accomplishments and a sense of certainty. I find it very reassuring and ego-reinforcing (in a good way). The second, “the alternative is not attractive,” is a bit of an aversion technique. There are always a couple of alternatives that come to mind, and both of them cause me to shy away from the painful ideas invoked and TOWARD action on my current projects. The third, breaking the projects into chunks, is more tactical and appeals to the part of me that’s good at that sort of thing. It gives me something tangible, a strategy, as a hook for the other good feelings. And lastly, my ability to ignore distractions speaks to an ability that I’ve cultivated over time, to totally block out distractions. Recalling that I haven’t always been able to do this and that I have truly, through my own efforts, developed this skill or ability reinforces feelings that I have efficacy in my life. So, can you see how each of these thoughts brings an ingredient to cook up a recipe of focus, concentration, an upbeat “I can do it” attitude and increases my energy? This technique can be translated to any type of unresourceful feeling/state that you want to change. A fear, anger, jealousy, feeling stressed, anxiety, procrastination, eating more healthily, changing a habit, etc. If you’d like to try this in your own life, just follow the steps below. Remember that for a few days or weeks (everyone’s different…give it a month of practice and see how automatic it’s becoming for you) your negative feelings will automatically start triggering your resourceful thoughts and you will be cooking up your own positive feeling jambalaya! So, here are the steps. Start with a feeling that you deal with on a regular basis that you want to shift in your life. 1. Notice the unresourceful feeling. 2. Identify the thought behind this feeling, but if you can’t quite figure out what that is, don’t let that stop you. Like I said, I don’t put energy into this part of the process. 3. The first time you do this takes the longest. Write out 2, 3 or 4 positive thoughts that counter or offer an alternative to the negative thought/feeling. Focus on thoughts that reinforce your abilities and skills, to make choices, etc. 4. Once you’ve written your positive thoughts, take the time to sit with each of them. Meditate on them, feel them for 5 minutes or so. Let yourself reflect on the learning and growing experiences in your life connected with these positive thoughts. Notice not only that they create positive feelings, but notice the flavor of those positive feelings. Jot down the specific type of positive associations with each thought-pride in past accomplishment? A reminder of your ability to take control and make changes? Gentle reminders to be grateful for what is present in your life (“consider the alternatives”)? An image of how incredible a friend or loved one thinks you are? Take time and sit with each of these thoughts and their feelings, really get to know how they help you. This process trains your brain and will become automatic. This isn’t an automatic shift at first, but with your intention, repetition and consistency, your neurology will learn “when I feel this, it shifts to that.” When this kicks in, you can even reach the point where it happens so automatically that you’re unaware of the negative first stage. Of course I also use self hypnosis and I actually use the same audios I sell here on HypnosisFirst. Today I used Motivation Increaser, which always leaves me feeling amazingly in control of my life, acknowledging how every small choice and change I make each day is leading me toward the achievement of my goals. 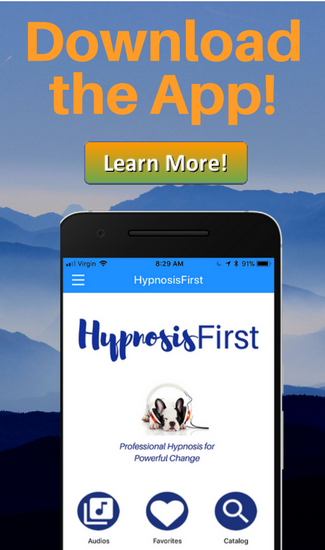 You can try Motivation Increaser for free, it’s available on the sidebar at the top of the page, and it will be one of the free audios on the HypnosisFirst app coming out later this month. The real point is, these techniques work. We all need a little extra help sometimes to feel as put together as we’d like to feel. People ask me all the time, “is what you do mind control?” And I say yes — it absolutely helps you control your mind! I hope you try a few of these techniques and find your favorites, too!